Costa Rican soccer sensation Raquel Rodríguez has accomplished a lot in the past six months. From netting the game-winning goal in Penn State’s NCAA national championship victory in December to getting drafted to the National Women’s Soccer League with the second overall pick in January, the 22-year-old marvel has already had her share of career-defining moments. But it could be her off-field presence in the equal pay debate in women’s soccer that leaves the biggest impact on her country and sport. After the U.S. women’s national team filed a wage discrimination lawsuit against its federation in March, Rodríguez told The New York Times that the Costa Rican Football Federation (FEDEFUTBOL) still owes women players $2,000 each for bonuses earned during their historic run in the 2015 Women’s World Cup. Rodríguez said that the pay issue has been a topic of constant conversation for this generation’s “Sele.” The women’s team has requested more benefits and support from the federation, which does not pay them a salary. FEDEFUTBOL declined to comment for this story. Rodríguez, who won the 2015 MAC Hermann Award as U.S. college soccer’s top player, spoke to The Tico Times via Skype from New Jersey, where she is off to a 1-2 start with her pro team, Sky Blue FC. In the conversation, she touched on equal pay, her on-field play, the transition to the pros, and her take on the future of Costa Rica women’s football. The interview as been edited for brevity and clarity. TT: You recently told The New York Times that FEDEFUTBOL stills owes you and your teammates $2,000 each from the World Cup 2015 bonuses. Has there been any communication from the federation regarding this delay? RR: Yes, they told us that because of everything that happened with the FIFA scandal and our ex-president [Eduardo Li] being involved with that, that not only our money but other finances have been retained until they resolve those issues. Until then, there’s not much they can do. They pretty much told us that they’ll give us the money sometime this summer. I think they said either June or July. At this point, we’re kind of waiting on that. $2,000 is not a great amount, but it can still go a long way. How much are your teammates in need of this money that FEDEFUTBOL still owes them? It can provide a lot of help and definitely something that is welcome for every player, especially to those who don’t make a living out of this. It honestly symbolizes something that we’ve earned and it’s the least that we can get back for everything that players do for the country and for the sport. At least a symbolic recognition of $2,000 is what the players deserve. 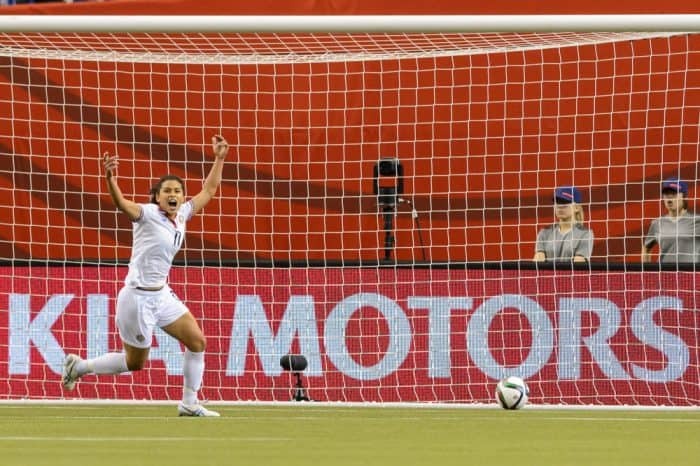 The women’s team made history when it got to the World Cup for the first time and has gotten far in Olympic qualifying. Do you think that your performance indicates that you should be getting paid, or at least be getting increased bonuses? Well, I think we have to start having those conversations. I don’t know if we can get paid yet because I don’t know if the federation is capable of doing that. But I do think we can have conversations where we sit down with the players and specifically write down what the biggest needs are. It doesn’t have to be a salary … but I think we have to start investing in the players. Whether that’s a certain amount of money per month or identifying specific needs that the players have and then fulfilling them. That’s almost better than a salary. I think starting to have those conversations would eventually lead to maybe having a salary in women’s football. We have to aim to get more professional in Costa Rica and that’s not only with the national team but also with the clubs. Women’s soccer in Costa Rica is so underdeveloped that anything is going to be progress. It’s really important to start setting long-term goals, as well as mid- and short-term. And investing. Absolutely. We know we are the pioneers and we know the ones who played before us went through even harder things like discrimination in its pure form. We know that we’re fighting for the next generations. We’re probably not going to enjoy many of the benefits we’re fighting for but we’ve sat together as players and said that we want to do this for the next generation. We are all really passionate about this because we know how rough it is. You’re in the United States right now where this latest equal pay argument originated with the U.S. women’s national team. What are the takeaways from their argument and how could they be applied in Costa Rica? First of all, it’s really encouraging just to see that there are women brave enough to speak up and put themselves out there when they’re in a vulnerable position. It’s never going to be easy when you go against the flow and you fight. It’s hard because we can’t compare ourselves with the U.S. national team. They have an argument that is very valid but, in our case, we’re in a different position. However, what I’ve learned from this whole equal pay dispute is that if we’re going to go and fight for what we want, then we have to do it right. We can’t just whine. It has to be something planned and we have to educate ourselves and go out there with a plan and a strategy and know what we’re doing. I think we haven’t gotten to that point yet. Maybe it’s because I’ve been in the U.S., but when you get out of the country your mentality definitely changes. You learn and then you get out of a certain ignorance that you had because you didn’t know any better. At one point I really got frustrated because among our team we didn’t really understand each other. I was willing to put myself out there but not everyone was. I can’t do it alone. My takeaway is that it has to be something done together and everyone has to be on the same page and understand what’s going on. We have to be all in. Like I said, this whole equal pay thing is very encouraging and we can learn so many things from [the U.S. national team]’s example. In the end, it’s women’s soccer around the world that will benefit from what the U.S. national team players are doing. After a really magical season at Penn State last year, how has the transition from college to the pro game been? It’s been quite the transition. I had been on the same team for four years in college and there’s a consistency to that. But here, everything is new. The whole team is new for me, so the transition of getting to know my teammates on and off the field is something that is part of the job. I’m someone who really thinks that if there is chemistry outside the field then there will be chemistry on the field. To be honest, I’m living the dream. This is what I’ve waited for my whole life — to just play soccer and dedicate my days to that. In that sense, I’m really enjoying it. There are some days that I’m kind of frustrated because I’m not quite there yet with my soccer. I’m glad, though, because that means I have so much more to learn. Certainly, having the teammates I have, who are really talented, helps me learn every day. 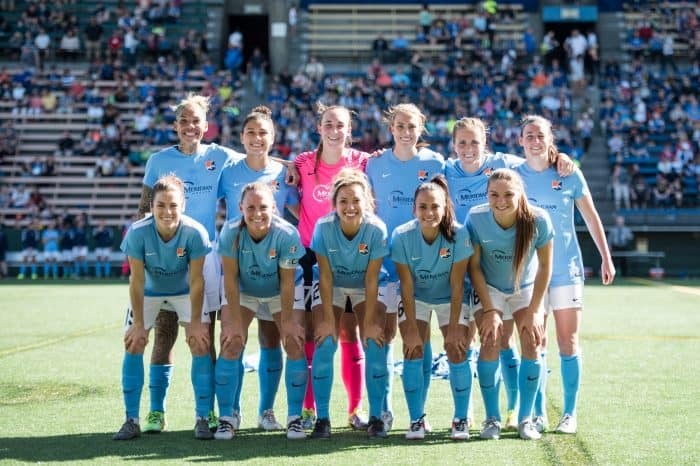 The U.S. women’s national team captain Christie Rampone is your teammate on Sky Blue and you’ve faced U.S. team goalie Hope Solo, who plays for Seattle Reign. What has it been like to play with and against these figures of international football? At first, I was a little starstruck, I’m not going to lie. I’ve played against them many times but having some of them as teammates is very different. Learning from them and how they carry themselves has helped. Not only them, but other players and teammates who maybe aren’t on the women’s national team but are still so talented. It’s great because I want to keep growing as a soccer player and that can only happen if I keep learning and getting challenged by great players. About ‘La Sele Femenina,’ after the first ever World Cup appearance and nearly making the 2016 Olympics in Rio, you guys seem to have established a really strong, young, core group of players. What’s the next main goal for the national team and what does the future hold for these young talents coming up? I think since we didn’t qualify for the Olympics, the main goal now is the next World Cup, France 2019. I hope as a soccer player and Costa Rican soccer player that our preparation towards this World Cup can be better than it was for the last. We have to qualify for this next one, of course. I have a lot of faith for the next World Cup and the qualification, and that we will be well supported, at least more than we have been in the past. There are great young players coming up but that’s not enough. They have to be able to learn and take advice from someone like Costa Rican women’s football captain Shirley Cruz, who is still playing. It’s so important to develop these young players and now that’s the future of our national team. It looks hopeful. It looks like a bright future.